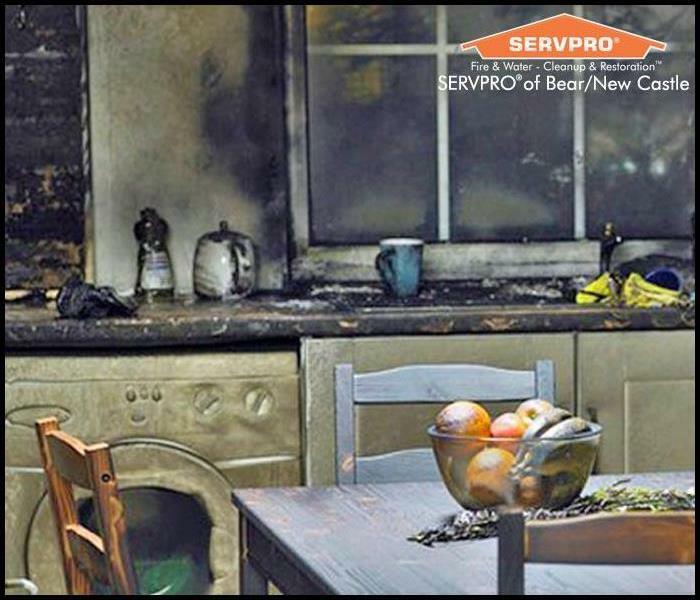 SERVPRO of Bear / New Castle is here to minimize the effects of a fire on both your home and your life. Fire and smoke damage is especially destructive. In many instances your property will also suffer from water damage from firefighting efforts. We specialize in fire and water damage restoration; it’s the cornerstone of our business. We understand you may be feeling confused, stressed, and more than a little vulnerable. 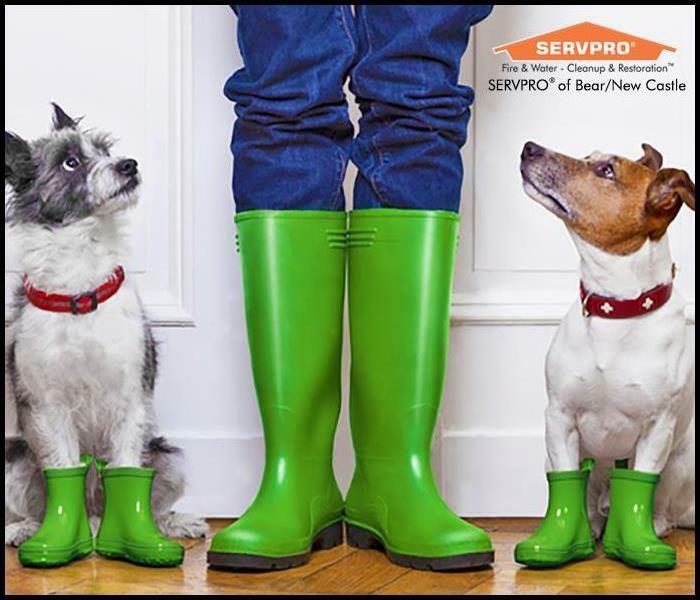 SERVPRO of Bear/New Castle’s technicians will treat your family with empathy and your home with great care. Until help arrives, please refer to our Fire Damage Tips—Until Help Arrives Guide and follow these tips to protect yourself and your property. Biological hazards, also known as biohazards, refer to biological substances that pose a threat to the health of living organisms – primarily that of humans. This can include samples of microorganism, virus or toxin (from a biological source) that can affect human health. It can also include substances harmful to other animals. Human or animal waste and body fluids. Medical waste (used bandages, etc.). All of these substances can harbor bacteria (like E. coli) and viruses (like hepatitis and HIV) that can cause disease in humans and animals. Biohazards may enter the body and cause damage if they are inhaled through breathing, ingested through swallowing or absorbed through breaks in the skin. Exposure to biological and chemical contaminants can pose serious health consequences. A failure to properly remove such substances can contribute to unhealthy and dangerous environments. SERVPRO of Bear/New Castle, DE is trained to safely remove biohazardous substances and dispose of them properly in accordance with OSHA and health regulations. Equipped with the necessary safety apparatus and cleaning products, we can help transform these unhealthy environments back into clean, safe homes and offices. We remove and dispose of bodily fluids, tissue and other potentially pathogenic substances resulting from accident, trauma, crime or death. Trained SERVPRO of Bear/New Castle Professionals clean, disinfect and deodorize the structure. SERVPRO of Bear/New Castle, DE realizes many of the chemicals used in the production of illegal drugs such as methamphetamine are volatile and can leave harmful residues throughout a structure. We follow federal and state guidelines to properly clean all surfaces. SERVPRO of Bear / New Castle has the expertise to provide a deeper clean than your basic house cleaning service. Designate just one or two entrances for muddy feet and paws. The first step in keeping mud out of your house during wet weather is to limit the number of places where it can be tracked inside. Use your mud room, or create one. Use a mat-and-rug system at every entrance. Every entrance needs a mat on the outside and a rug on the inside. The outside mat should be a bristly or rubber mat that will trap or scrape off mud. Just inside each of your doors, you should have a washable rug. Teach your dogs and children to stay on the rugs. Once you have your mat-and-rug system in place, teach your children and dogs to stop on the rug and stay there until you have had time to remove muddy shoes or wipe muddy paws. Keep muddy shoes off of your floors. A boot tray is a simple, inexpensive solution for muddy boots and shoes and can be placed on a porch or in your mud room by the door. Keep towels by the door. Keep a basket of clean towels in your mud room or by your designated entrance. This will ensure that a towel is always handy when you need to dry off a wet child or wipe muddy paws. Life happens. Kids spill drinks, pets have accidents and homes get dirty. 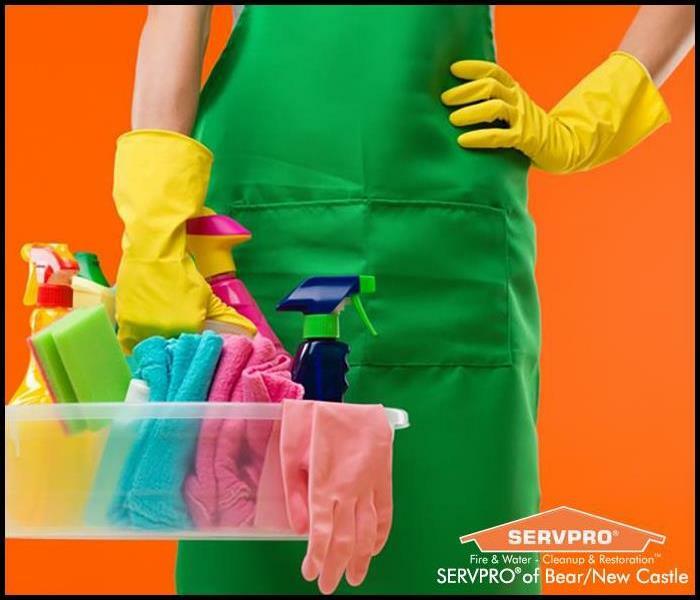 SERVPRO of Bear/New Castle have the expertise to provide a deeper clean than your basic house cleaning service. Our residential cleaning services will ease the burden of the constant maintenance cleaning of your home, but will also create a safe, clean and comfortable living environment for you and your family. 24/7 Fire Damage Restoration Service - 24/7 Water Damage Restoration Service - 24/7 Flood Damage Service - 24/7 Sewage Damage & Sewage Removal Service - 24/7 Mold Remediation Service - 24/7 Bio-hazard Cleanup - 24/7 Suicide & Crime Cleanup - 24/7 Board-up and Roof Tarping. Our residential cleaning services will ease the burden of the constant maintenance cleaning of your home. There are many things you can do to “detox” your home, some more practical than others. Here are a few suggestions to help you get started. Go barefoot or wear slippers. Outdoor shoes bring in dirt, pesticides and even lead. Place floor mats vertically by your entryways to wipe your shoes. A clean mat will trap more dirt and residue from your shoes. Remove odors with baking soda or contact SERVPRO of Bear/New Castle to effectively deodorize your home. Use fresh flowers or bowls of herbs like rosemary and sage to add a pleasant fragrance to rooms. Have your air ducts and vents cleaned by SERVPRO of Bear/New Castle, DE. Start replacing commercial cleaning products with safer, greener ones. Don’t be afraid of DIY; there are many effective and safe cleaners that can be made out of non-toxic household staples like baking soda, plant-based dish soap, vinegar, and hydrogen peroxide. Most plastics contain the toxic compound Bisphenol A, a hormone disruptor. Do not use plastic containers in the microwave. PTFE, a polymer used in nonstick cookware as well as in food packaging, can release potentially hazardous fumes. PFOA, a chemical used in nonstick coatings, like Teflon, is a human carcinogen that many companies plan to phase out of their products. Replace your pots and pans with healthier alternatives that won’t leach chemicals into the air. Try glass, cast iron or stainless steel. More dust means more toxins. Dust your furniture using a microfiber cloth. Mop all surfaces at least once a week. Use a vacuum cleaner with a HEPA filter, for your carpets. HEPA-filter vacuums capture the widest range of particles and get rid of allergens. Keep moisture levels to a minimum to stop the growth of mold and mildew. Monitor the areas where mold most commonly grows (bathroom, kitchen and basement) for moisture accumulation or leaks. Regularly clean surfaces where mold usually grows – around showers and tubs and beneath sinks. Filter tap water to eliminate toxins by using a carbon filter (pitcher, faucet-mount or dispenser). Use a showerhead filter to remove chlorine and other potentially harmful chemicals. Radon is an odorless gas that forms as uranium in rocks and soil breaks down. Check Radon levels in poorly ventilated basements that have cracked walls and or floors. Leaks are most commonly found in leaking gas stoves, gas fireplaces, furnaces and chimneys and gas water heaters. Use a certified CO detector to check your home for carbon monoxide leaks in furnaces and other home appliances. SERVPRO of Bear/New Castle routinely inspect the heating, ventilation and air conditioning unit (HVAC). Keeping them clean can extend the life of the equipment. This can in turn save you money and give you cleaner air to breathe. However, duct cleaning is not always necessary. We will make recommendations about the best way to address any indoor air quality concerns. This can save you money and provide peace of mind on the health of your system. Call SERVPRO of Bear/New Castle at (302) 392-6000 to schedule your air duct and HVAC cleaning. Life happens. Kids spill drinks, pets have accidents and homes get dirty. SERVPRO of Bear/New Castle has the expertise to provide a deeper clean than your basic house cleaning service. Our residential cleaning services will ease the burden of the constant maintenance cleaning of your home, but will also create a safe, clean and comfortable living environment for you and your family. You know SERVPRO of Bear/New Castle as a leader in Fire and Water Cleanup and Restoration, but our professional residential cleaning services can also make a dirty carpet "Like it never even happened." If you have a basement, your sump pump is often your last line of defense against flooding. It works by safely diverting water away from your house and is especially important during times of heavy rain when it puts your home at risk of water damage. If your sump pump fails, you could find your basement under water. When this happens, it is important to act fast! Water damage can be a progressive issue and if not dealt with in a timely manner, this could lead to structural damage, mold and much more. It is important to make sure your sump pump is in working order. Otherwise you risk the chance that it could fail when you need it most. After heavy rains, check the sump pump inlet screen for any blockages. Blockage is one of the leading causes of sump pump failure. Occasionally, test your sump pump to ensure it is working properly. You can do this by filling the pit with water and watch to see if it is pumped away. If not, you may have a problem. Check the float control to make sure it is free and not restricted or hung up. Replace the battery backup every 2-3 years. The last thing you need is to find out your batter backup is dead in the middle of a power outage during a big storm. When your home has water damage from flooding or leaks, you need the company that can respond immediately and has the expertise and equipment to properly restore your property. SERVPRO of Bear/New Castle uses advanced water damage inspection and extraction equipment to help them find the moisture and to remove it as quickly as possible. Our highly trained technicians will monitor and document the drying process so that you know your property is back to normal. Treat any mold with caution – stay out of affected areas and don’t touch or disturb the mold. You may have seen sensational news reports that warn about the dangers of "black mold" or "toxic mold". These reports can be alarming and confusing so it’s beneficial to get the facts to better understand mold. Since many types of mold can cause reactions, you should contact us regardless of the color or type of mold. In many instances, multiple types of mold may exist in the same house or structure. 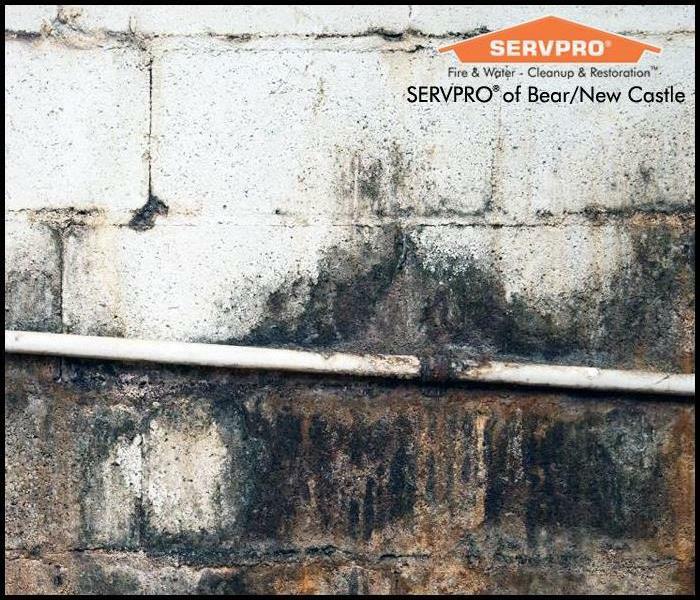 If you suspect you have a mold problem, contact SERVPRO of Bear/New Castle immediately. When failed construction leads to a wet basement, call SERVPRO of Bear/New Castle to extract the water and moisture. Do you have a wet basement? Even if you don’t know the root of the problem, you should take action now. This is a situation you’ll want to resolve right away to prevent even more serious, ongoing damage. Often, a wet basement indicates a failure of your foundation. When your foundation begins to waiver in its duties of keeping moisture and water on the outside of your home, it rarely happens all at once. 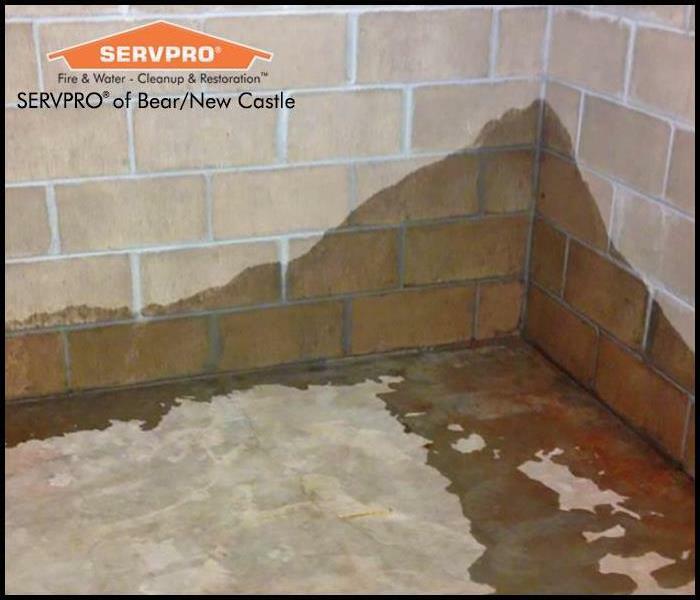 With the appropriate tools and experienced eyes, SERVPRO of Bear/New Castle's team of restoration specialists can identify and repair these vulnerable spots before further degradation occurs. The scope of service depends on the products and procedures needed to rectify the problem. Simply applying a waterproofing formulation or even trenching along the exterior perimeter to control French drains and tiles may be in order. Hydrostatic concrete is also in our arsenal of products. Vapor barriers form an integral factor in the prevention of water seepage. Additionally, your wet basement can allow for mold growth. With naturally occurring mold spores in the air, warm air and moisture are the only elements required for these spores to seat themselves on surfaces and form colonies. Resolving dampness through SERVPRO of Bear/New Castle's dehumidification and drying processes can eliminate the components that encourage fungal growth. From the moment our restoration specialists arrive at your home, we locate the source of the moisture, assess the full scope of the damage, and map out a restoration plan. While a wet basement might not seem like a huge problem, it could lead to much more disastrous results if it is not resolved immediately. 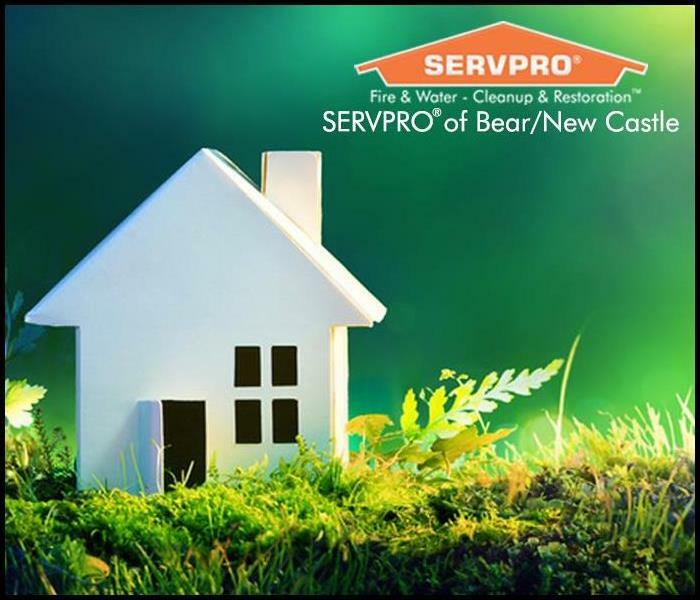 Call SERVPRO of Bear/New Castle today at (302) 392-6000. When a storm hits your Bear home, you need the company with storm damage experience and expertise. While many of us look forward to the changing season of Spring with the warmer weather and the trees and flowers starting to bloom, there is one part that isn’t so great. Springtime always seems to bring plenty of rain and plenty of rain always brings a higher risk of water damage to your home. With the increased showers as well as high winds, roof damage can happen or be revealed as water seeps through your roof and damages your ceilings and walls. To reduce the risk of roof leaks, you should inspect your roof for any damages from the winter and inspect it after every major storm. The most common cause of roof leaks is a damaged or missing shingle from storms or fallen branches. If you do experience water damage inside your home from the ceiling or wall, you will want to contact a professional from SERVPRO of Bear/New Castle to inspect the damage, remove the water, and remediate the damage. Another common source of water damage is from old or damaged windows. Water especially from a huge storm can blow into cracks and crevices around your window causing water damage that may not be discovered quickly allowing mold to develop and cause further damage. Make sure to inspect around your windows and doors for cracks or old caulking that has peeled or cracked off. You can usually caulk any small cracks or crevices to ensure water doesn’t seep into your home causing damage. If you have a basement, you understand the importance of a sump pump. Without one water can seep into your basement and cause lots of damage. One of the most common causes of a flooded basement is a sump pump that stopped working. To prevent this from happening, you can do three things. You can get a backup battery for your sump in case the power goes out. 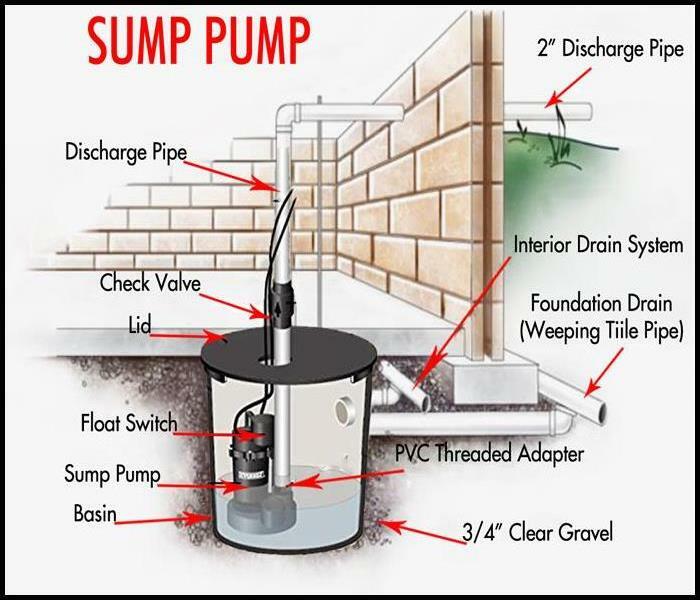 You can get a backup sump pump that is usually set to come on if the water rises above the normal level for your working sump pump. So if your sump pump either stops working or can’t pump the water out fast enough, your backup will kick in. The last thing you can do is install a water sensor alarm on the floor near the sump pump. While you may still have some water damage, at least you will be able to catch it fast and have SERVPRO of Bear/New Castle’s professionals come out to pump out the water and dry out your basement. If the foundation around the base of your home and the basement walls cracks, water can seep into the basement or crawl space. A sump pump won’t help you since the water is seeping through the walls as opposed to being channeled to the sump pump. Usually people discover foundation cracks after a big storm or when a gutter is clogged and the water is falling right by your house. Repairing foundation cracks can be a very expensive job depending on the situation but without the repair, there is no way to prevent the water leaking into your basement or crawlspace. It never hurts to walk around the perimeter of your home checking for any potential foundation cracks as well as checking any bare walls in your basement and/or crawlspace. If you should suffer water damage whether from Spring weather or a cracked pipe or an overflowing bathtub or toilet, call the water damage cleanup experts at SERVPRO of Bear/New Castle at (302) 392-6000 for 24-hour emergency service. 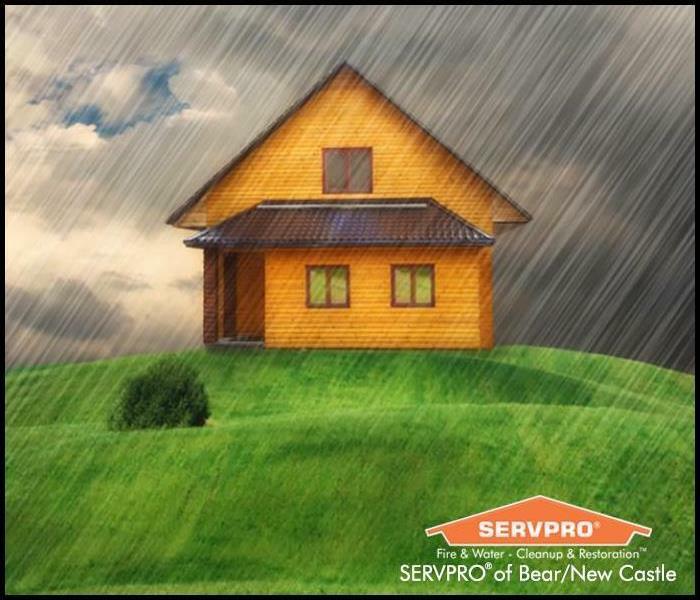 At SERVPRO of Bear/New Castle, we have specialized equipment, professional training, and certifications that allow us to restore your home to its pre-water damage condition. Spring cleaning is a tradition that allows us to freshen up our homes after a long winter. It is that time of year to open the windows and let the fresh air in. This checklist will help you get a jump start your spring cleaning. A clean environment is a healthy environment. Improve your living and work spaces this spring. 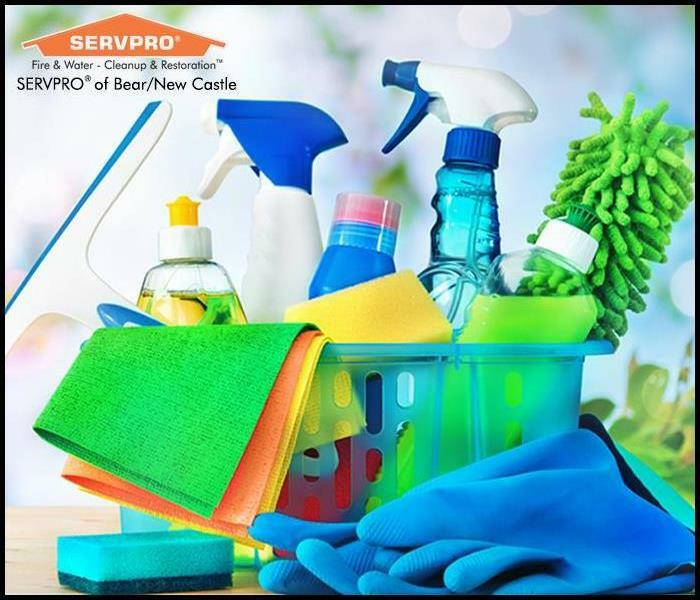 If you need a little help, don’t worry, SERVPRO of Bear/New Castle has all the tools to provide a deeper clean than your basic house cleaning service. 4/20/2019 - What is a Biohazard? 4/9/2019 - What is Black Mold? 4/1/2019 - Getting Prepared for Spring Rain!